Most people have okra fried, dilled or in a Gumbo. A more elegant approach to enjoying okra is as a simple salad. If you are turned off by the slime of okra, don't be. I say, if you can eat raw oysters, you can eat okra. College Football is starting and fried okra makes a great appetizer. Pickled or Dilled Okra makes a great snack. Filled with Vitamin C and high in fiber and the added benefit of providing antioxidant. 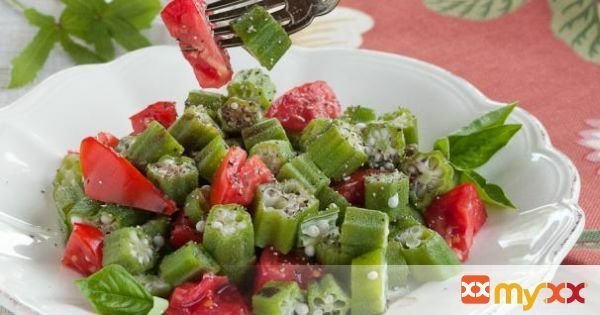 Steam okra and add to tomatoes and drizzle a little balsamic vinegar over it and you have a beautiful salad for any entree. 1. Remove ends of okra pods, discard. Slice okra. 2. Place okra in a basket and steam for five to seven minutes. 3. Roughly chop a tomato. 4. When okra is cooked, place in a bowl and toss with tomato. 6. In a small bowl whisk basil into balsamic vinegar. 7. Drizzle over okra and tomato.